Meet this summer’s biggest blockbuster: it’s not a big Hollywood movie, it’s a delicious frozen treat with Mexican origins called a paleta – and it’s taking North America by storm. Photo credit: Paleteria San Antonio. It might be tempting to describe them as popsicles, but that’s selling paletas short. They’re so much better than the mass-produced frozen treats made with artificial food coloring, flavorings, and processed sugar you ate as a kid. In cities both large and small, paleterias specializing in the ice pops are springing up where makers take an artisanal approach, playing with inventive combinations of flavors. Some are taking to the streets and selling their creations from carts. As more and more people continue to fall for paletas, their popularity has soared. 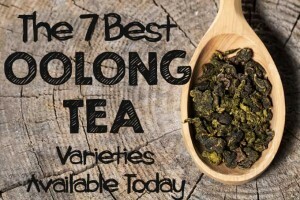 Have you tried them yet? Once you do, you’re sure to be inspired to create them at home. They’re easy, fun, and tasty – a good alternative to ice cream when you’re craving something cold and satisfying on a hot day. Or, if you’re looking for a new twist on a cooling summer cocktail, you can even make them a little boozy if you like (adults only, of course!). 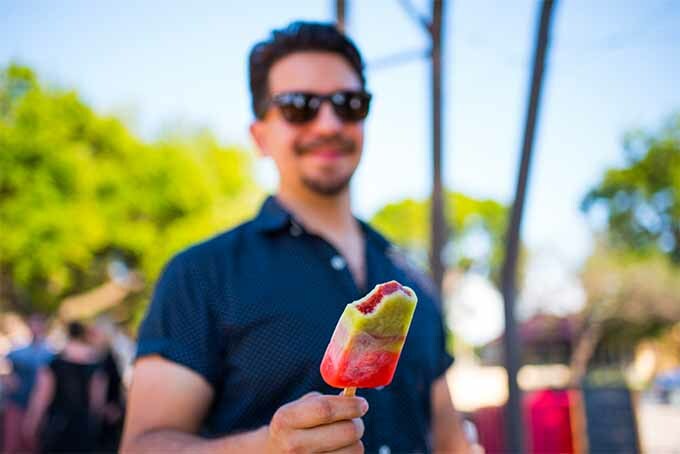 While food historians believe ice cream originated in China and was brought to Europe by Marco Polo, the origins of the paleta are less certain. Some think servants fetched ice from the Popocatépetl volcano, near Mexico City, for Aztec emperors who would mix it with fresh fruit. But that might be more legend than fact. 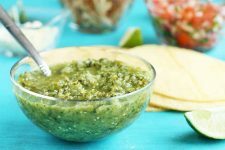 According to Eat Mexico, A more plausible explanation may be traced to the early 1800s. Mexico was celebrating its independence, and that meant Spain’s monopoly on ice and the sky-high taxes on it were over. Common folks could afford it and were able to experiment, adding fresh fruit to create something delicious and practical for beating the heat. Fast forward to the early 1940s. La Michoacana, a family-run business based in Tocumbo, Michoacán, first made ice cream before adding paletas to their lineup of treats. Their popular milk-based paletas include a variety of unique flavors: coffee, coconut, prune, pine nut, chocolate, blackberry cheesecake, and chongos zamoranos (based on a Mexican dessert made with curdled milk. 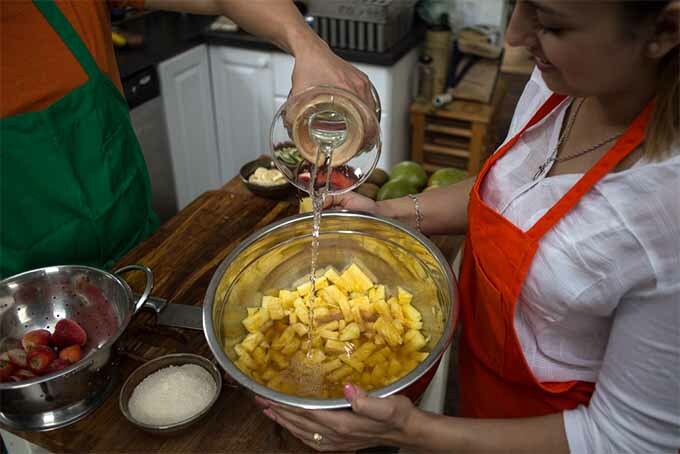 Water-based non-dairy varieties come in flavors like tamarind and soursop, guava, watermelon and cantaloupe, mango, strawberry, lemon, and grape with cucumber and chili powder. Paletas may also be dipped in chocolate and rolled in crushed nuts, graham cracker crumbs, crushed wafers, shredded coconut, chopped herbs, and sea salt. Imagination is the only limitation. Paletas caught on in Mexico and spread throughout the country. La Michoacana frozen treats are sold in an estimated 15,000 locations, now including outlets in the U.S. It was official: The paleta movement was on. Joey Rodriguez from San Antonio, Texas took inspiration from those traditional paletas to create his own versions for his new store, Paleteria San Antonio. He also understands what they mean to people. Joey and Cecy Rodriguez. Photo credit: San Antonio Paleteria. Rodriguez and his wife Cecy wanted to recreate that same joy at their paleteria, which they opened in May 2016. 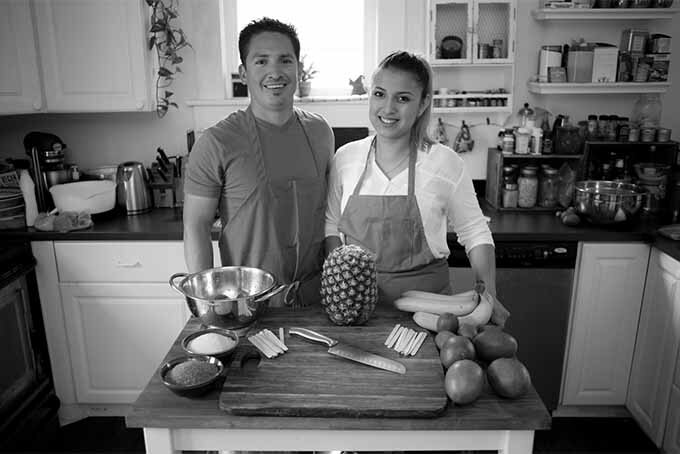 Rodriguez learned to make paletas when he worked for a local ice cream maker for four years. He saw firsthand the artistry that goes into making more than 20 flavors. But he was ready to concentrate on paletas in a shop of his own, and let his creativity soar. 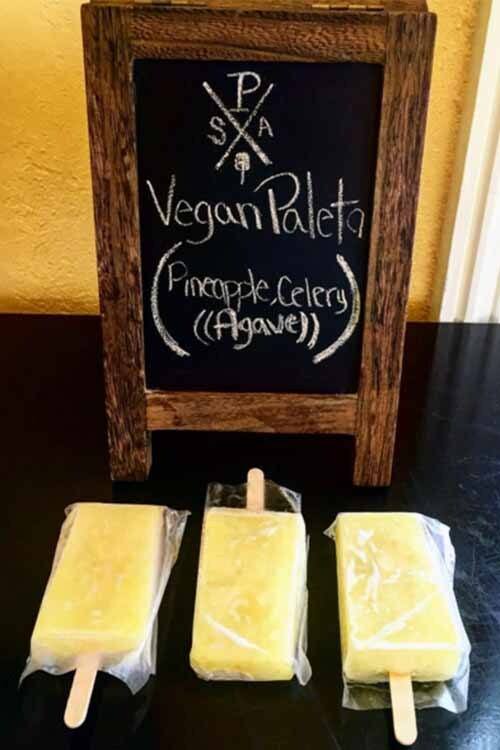 Vegan paletas with pineapple, celery, and agave. Photo credit: Paleteria San Antonio. His current flavor roster includes 56 varieties that rotate through his shop 16 at a time, from avocado and lime to cucumber, eggnog, and Oreo. And Paleteria San Antonio also offers vegan versions of their frozen treats. 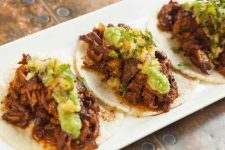 One typical Mexican ingredient that Rodriguez likes to use is chili powder. 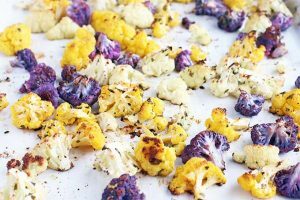 A generous sprinkle elevates the flavor, not with heat, but by bringing a complexity to the overall taste. It’s an idea worth borrowing for your own creations. Prepping fruit. Photo credit: Paleteria San Antonio. 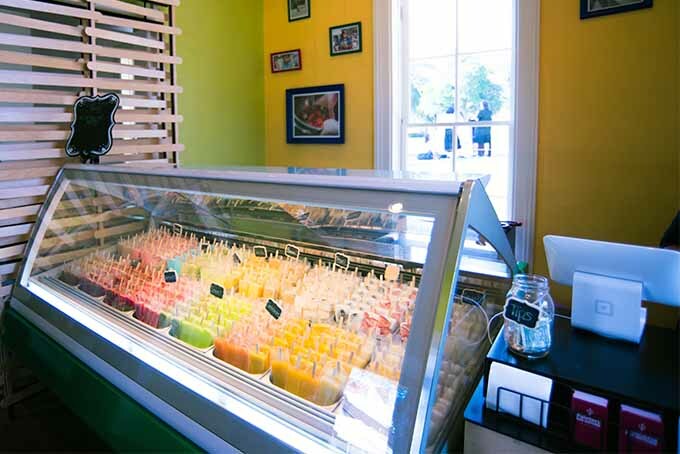 “We have customers that come in and don’t know what a paleta is, but when they see the freezer and the array of flavors we have, they understand quickly,” says Rodriguez. 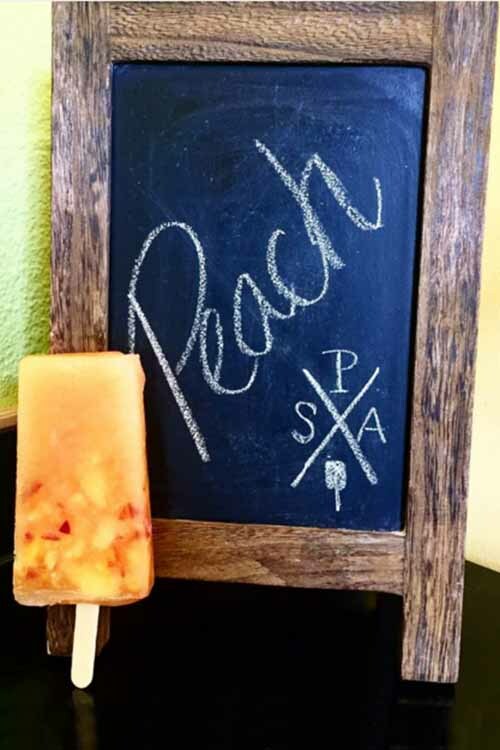 For Nadia Robinson, the peach paleta she tried at the Bonnaroo Arts and Music festival in Manchester, Tennessee was an eye opener. 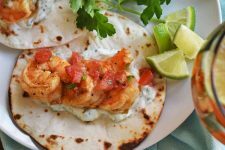 “It was such an explosion of flavor that I’ll never forget. I had never tasted anything like it,” she recalls. 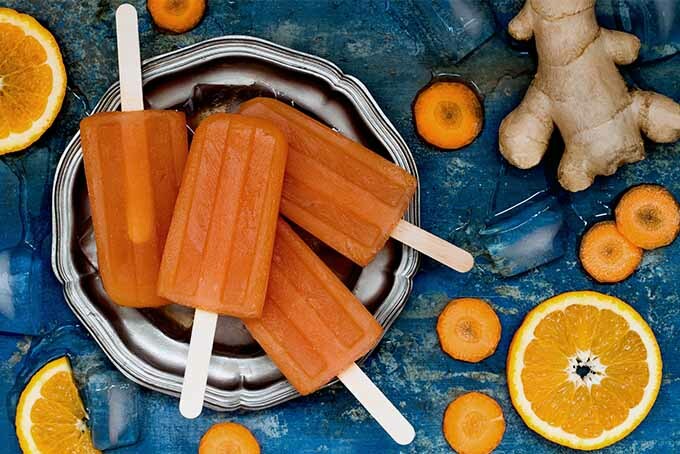 On the drive back home to Burlington in Ontario, Canada (less than an hour from Toronto), she, her husband, and their two kids talked about whether they could start a paleta business of their own – one that incorporated their beliefs about health and eating a plant-based diet. Nadia Robinson. Photo credit: Hippie Pops. Robinson read a ton of books about the subject before she even stepped into her kitchen. 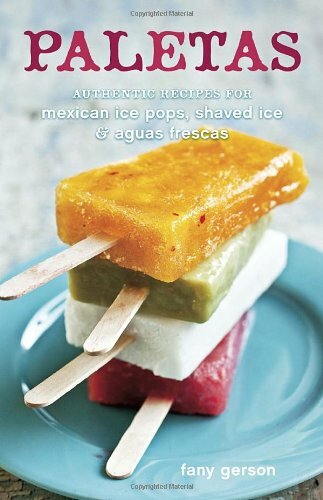 She highly recommends Fany Gerson’s Paletas: Authentic Recipes for Mexican Ice Pops, Shaved Ice & Agua Frescas, available on Amazon. 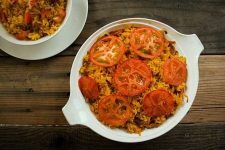 She tried out various recipes that she gave to neighborhood kids in exchange for their critiques. She launched her business, Hippie Pops, two years ago. 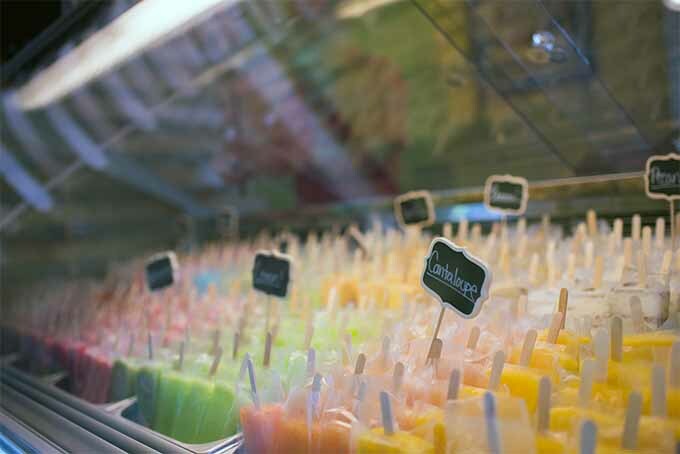 It supplies paletas to a number of local businesses. She also has a cart that she stocks with treats to sell at festivals and events. 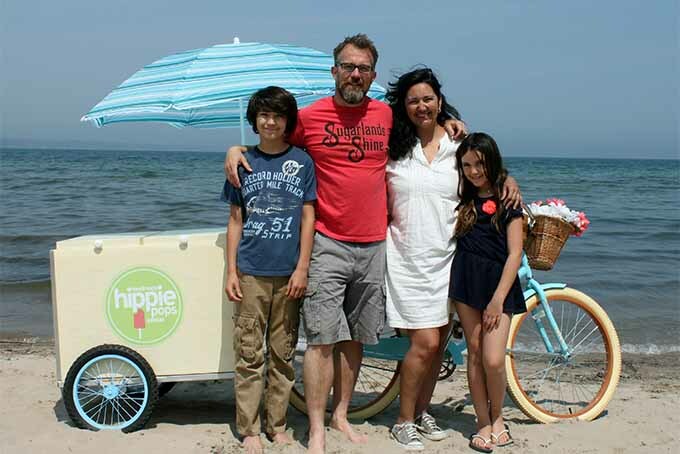 The Robinson Family with their paleta cart. Photo credit: Hippie Pops. 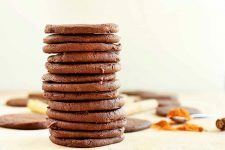 To make her nutrient-rich, vegan versions, also suitable for those on gluten-free or lactose-free diets, Robinson makes everything from scratch, including chocolate and nut milks (like cashew, coconut, and almond), which replace the dairy base (i.e. yogurt, cream, or milk). 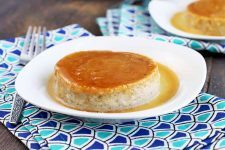 Instead of processed sugar, she opts for maple syrup or organic cane sugar and leans heavily on good, local, fresh fruit to provide natural sweetness. For beginner paleta makers, Robinson suggests mastering a few easy recipes at first. Then go off the grid and experiment. Her key rule of thumb: Have fun! We refer to Fany Gershon’s list of essential tools, as outlined in her book, to make these frozen treats at home. 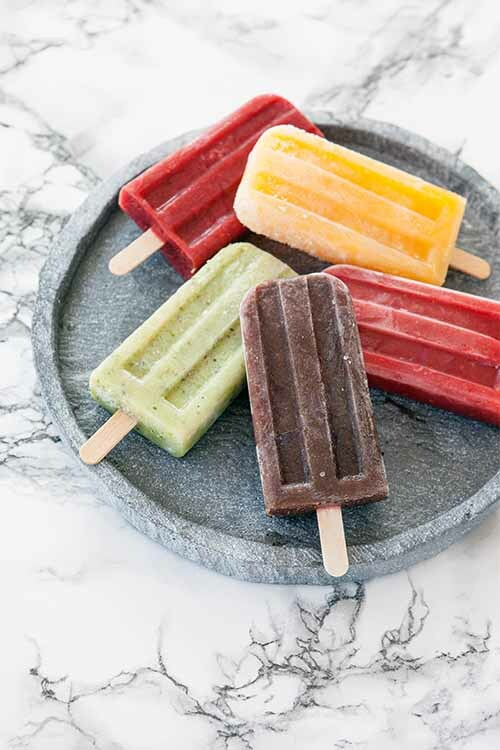 Ready to Make DIY Paletas? 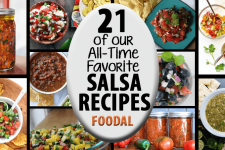 There are scores of recipes for paletas available online and many books on the subject. But if you’re raring to go, these aren’t a necessity. Just make your favorite smoothie (like our selections in this post, or this Papaya Ginger Smoothie, which we think is just begging to be made into paletas), pour it into a mold, and freeze. Peach is the flavor of the day! Photo credit: Paleteria San Antonio. 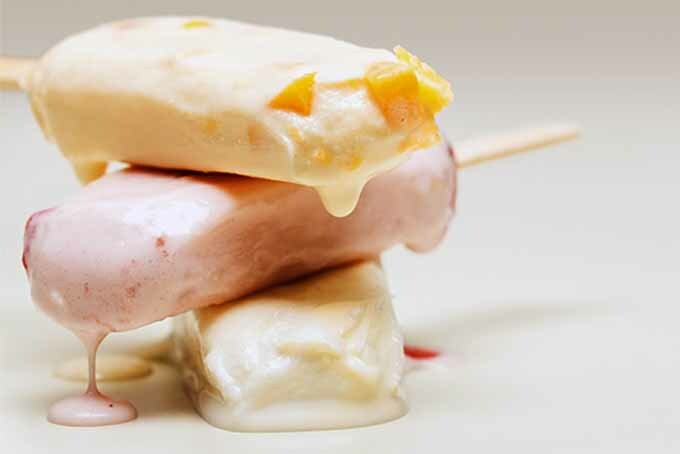 Go ahead and experiment with fruit and ingredients you have on hand, or even go for fruitier, juicier remixes of popsicle recipes (like this one featuring tahini, figs, and bananas). 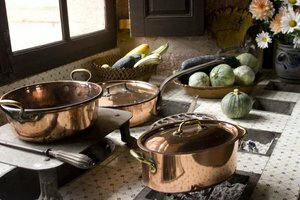 Once you’ve mastered the basic recipe, expand your horizons with advanced techniques like slow roasting fruit, or using a smoker to add richer flavor to nuts and other ingredients. 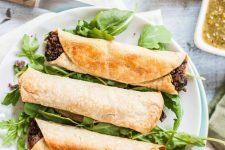 Nadia Robinson also shared her recipe for Cafe Con Choco-latte Paletas with Roasted Bananas, with step-by-step instructions. 1. What’s Your Preference – Smooth or Chunky? 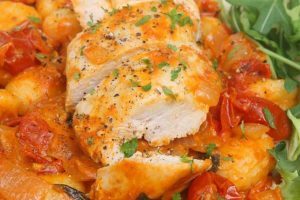 Fans of the chunky variety can slice or muddle whole, fresh fruit or add nuts and chocolate chips. Smooth operators can use a blender to create a fine puree. Purists can even pour their mixture through a sieve to remove seeds or pulp, particularly relevant when working with fruit like strawberries, raspberries, blueberries, and kiwis. Instead of the usual flat popsicle-type sticks, try using wooden skewers (but be careful when giving these to kids – those ends are sharp! ), cinnamon sticks, or bamboo sticks (which are antibacterial and reusable). 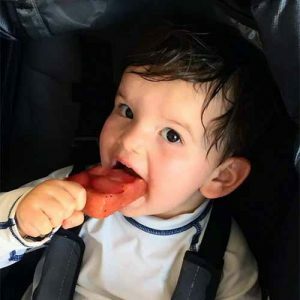 This toddler is enjoying his fruit paleta! Photo credit: Paleteria San Antonio. Use a pitcher with a spout to pour your mixture into the molds. And always leave one-quarter of an inch of space near the top, to allow for expansion while freezing. Crank your freezer up to the coldest setting to set your treats quickly. The temperature should be 0°F, or as close to this as you can get. Water may freeze 32°F, but it’s not cold enough to freeze alcohol or mixtures with a high sugar content. 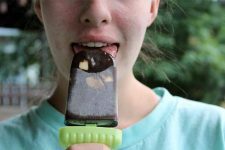 The Zoku freeze pop makers are especially good for this – check out our review of this and other popsicle molds and makers on Foodal. 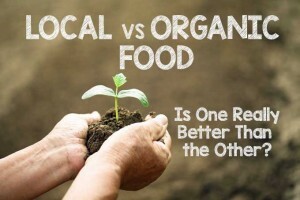 Of course, energy efficiency is important in the summertime – you can also simply try sticking to non-alcoholic blends and those made with less sugar (like yogurt-based pops), and hold out for a freezing period that’s a little longer to be the most environmentally friendly. 5. Don’t have a fancy mold? Try plastic cups or ice cube trays. Or use a loaf pan, then slice into individual portions like semifreddo with a hot knife once frozen. 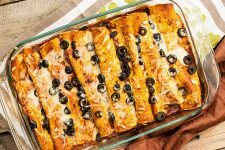 If left in the mold, paletas may pick up foreign flavors from other foods in the freezer, or develop freezer burn. Avoiding this is a simple process. First, you want to remove frozen paletas from the mold, and wrap them tightly in plastic if you’re not going to eat them right away. Then place your wrapped pops in a zip-top bag, or layer on wax paper in a resealable container for storage. 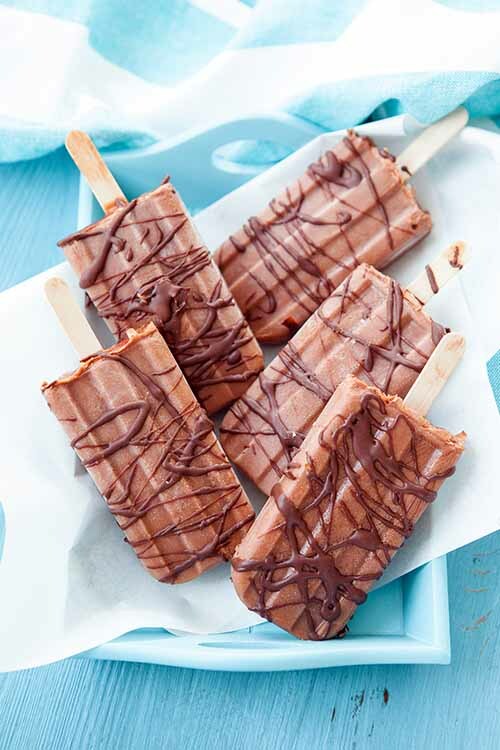 Wrap a paper cupcake liner onto the bottom of the paleta when you’re ready to eat your creation. 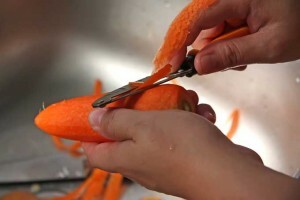 Simply slice a small slit the size of the stick into the center. Any drips will be caught, and you won’t need to worry about sticky hands (or floors). 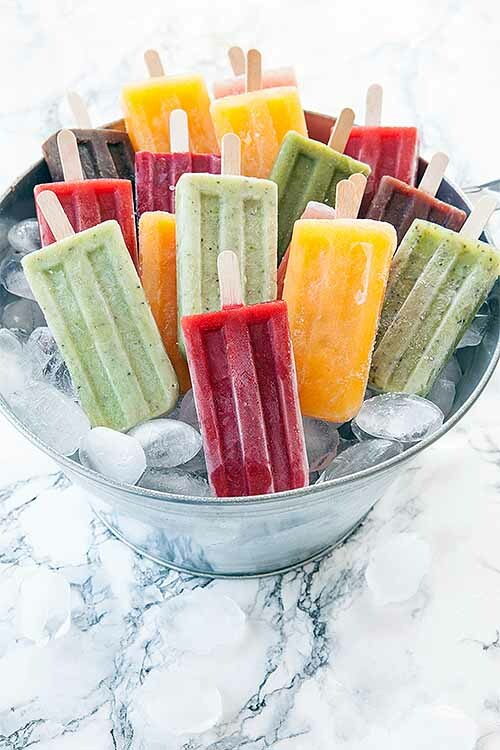 If you’re having a tough time getting your paletas out of the mold, dip the bottom portion into a bowl of very, very hot water for 10 to 15 seconds. This will help them to defrost just enough to slide out easily. 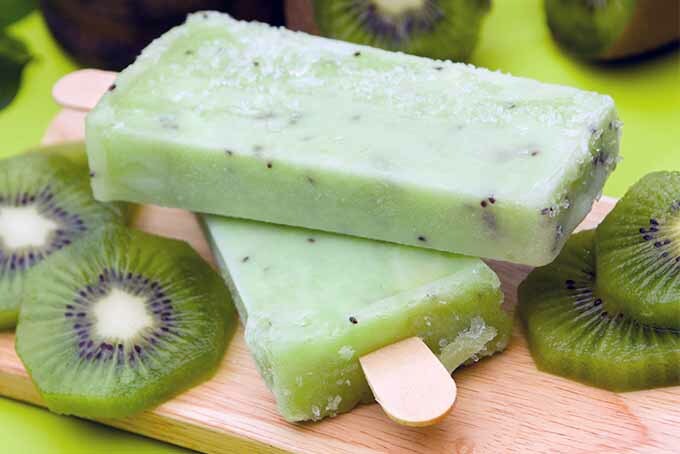 Making paletas that everyone can enjoy is a fun summertime project for kids of all ages! Get creative, and brainstorm favorite flavors. Create new combinations, and cut fruit into fun shapes with tiny cookie cutters (or a paring knife, with adult supervision). So many options… Photo credit: Paleteria San Antonio. Now you’ve got the basics of paleta making covered. It’s time to start playing with new flavor pairings and creating your own recipes. Let us know in the comments what crazy, wacky, deliciously fun combinations you discover. We want to try them, too! Photos provided by Paleteria San Antonio and Hippie Pops. Uncredited photos: Shutterstock. 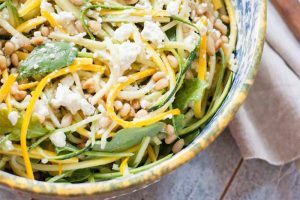 Based near Toronto, Ontario in the small town of Paris, Michele Sponagle specializes in lifestyle subjects, especially food, travel, and health. She has written three books and contributes to many top media outlets. 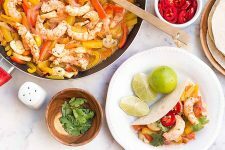 Her adventurous slants on food and culture have taken her to 70 countries and still counting. 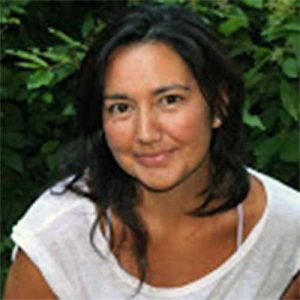 She has fished for king crabs in the freezing waters off the coast of Norway, and foraged for chanterelle mushrooms in the forests of Oregon. Her proudest accomplishment to date is learning to like eggs. Yum! These look fantastic, and a perfect treat to help alleviate this heat wave we’re currently having. They look like fun to make as well. We have excellent peaches here right now, and it’s one of my favorite flavors (for just about everything). I can’t wait to try some of these. Much healthier too, so I think I’ll make some for the grandkids as well. Their mama will appreciate the healthier choices of ingredients. Fresh peaches would work so well in these. Maybe throw in some fresh mint and a bit of lemon juice. Let me know how it goes. I’m sure they will be delicious! Oh, I never thought of adding fresh mint. What a great idea. Well I am usually pretty weary of desserts that are from other countries, and I am not sure what it is – probably just some bad experiences – but it is just the desserts. Anyways, I might have to try this one though, and I am betting that it might change my opinion on the matter. These look delicious, and I am saying thanks for the opening up of my mind that is about to happen thanks to you sharing this. Can’t wait to try one. I have never experienced one of these in my life. However, I love frozen treats and make a lot of ice cream and Popsicles myself. 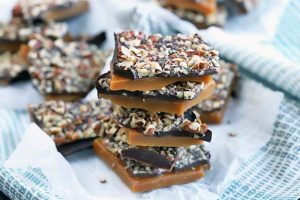 These treats are definitely something I will have to experiment with because I love being in control of what ingredients I use and being able to use the best fruit available. The pictures really drew me in and I had to click on the story to learn more. These really remind me of a place called King of Pops, they are organic and use a lot of fresh fruit in their popsicles, too. Although the entire process seems a bit complicated for my skill level in the kitchen (not very skilled) I can tell it will be worth it based on how delicious these look! Perfect summer treats! This is fantastic! 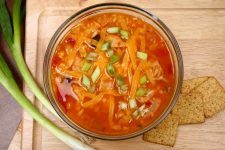 It is tasty and perfect for the warm days. The best thing is that you can have it in so many different ways, you can make them just they way you would like to! I can promise that it’s 100% worth it. This was such an interesting read! I didn’t knew the whole origin of paletas, and it was a long process! But it was definitely worth it. And yes, there is La Michoacana paleterías everywhere, they have all sort of paletas and nieves variations that you can imagine, and the coolest thing about it is that they are all natural, and that’s a really refreshing touch. Paletas are a Sunday classical over here, it’s a common desert after going to church or hangin out on downtown on a Sunday, and that’s one of the main reasons why I love Sundays. Thank you for an excellent article about something, Paletas, that we have just discovered in Santa Barbara, CA, and love them! Very informative & exciting! Want to make our own!